My first job after leaving the bosom of my Alma Mater was in the Strand branch of Athena around the mid 90s. We stocked such ‘classics’ as Spencer Rowell’s ‘L’ Enfant’, along with stoner favourites such as ‘I like the Pope the Pope smokes dope‘, ‘Bank of Ganga‘ and ‘Take me to your dealer‘. The obligatory Kurt Cobain and Jim Morrison shots and very zeitgeisty at the time was the ‘Choose Life‘ Trainspotting piece. All of which are still available it seems, and all of which were much loved at the time by the hordes of shop lifting teenagers from all over the world who’d ransack the store after their obligatory pigeon feed in the square. The one poster we didn’t stock however, was Tennis Girl. We’d often get older city folks come in and nostalgically ask for it, only to have to send them away empty handed. Well you can own it again, but instead of £2 it’s now a £300 limited edition signed by the Photographer and printed on canvas, courtesy of Pyramid Posters. (Must need the money, I hate photos on canvas, they looks really cheap) And for the completest, you could try getting your hands on the original dress and racket as worn by Fiona Butler which didn’t meet it’s reserve price in a charity auction last year. There’s an interview with her here. It’s an odd image in a way. Now derided by critics, yet emulated by comedians and popstars, it’s now firmly part of the national consciousness. It was at the time however, the rudest thing you could get away with on a teenage bedroom wall. Mr Elliot admits his poster is “not a picture I would buy”, but puts its appeal down to the seaside postcard spirit of the image, coupled with “one of the world’s fantasies that you are going to see up a woman’s skirt”. (source BBC). Diane Smythe makes a good point in her leader for this weeks ‘the naked issue’ British Journal of Photography about the impact of Levy’s ‘Raunch Culture’, is Tennis Girl the start of that? Or was that Babs Windsor in Carry on Camping? Or Abi Titmus? Or Manet? – discuss. As Stuart Marconie says in his excellent Pies and Prejudice, Scousers are like the Basques of the North. After taking this picture I was told ‘not to look this way’ buy a member of Southern rail staff. ‘Why’ I said. ‘It’s the rules’. ‘Who’s rules?’ I asked ‘You can’t stop us from looking’. I slowly began to move away. Moments later the female British Transport Police office third from the left in the photo felt the need to cross over the tracks from the other platform to challenge me. ‘Do you think it’s right to take pictures of a dying man, who’s probably not going to make it?’ ‘Well I am a photographer and work for the media’ I replied. At that her much bigger colleague moved in as well as the two Southern rail staff and I was ‘encouraged’ to move away. Just look at those firemen, what are they doing if not ‘rubbernecking’? Was I right to take it? I think so. If only to highlight the exemplary work of the emergency services in trying to save the mans life. 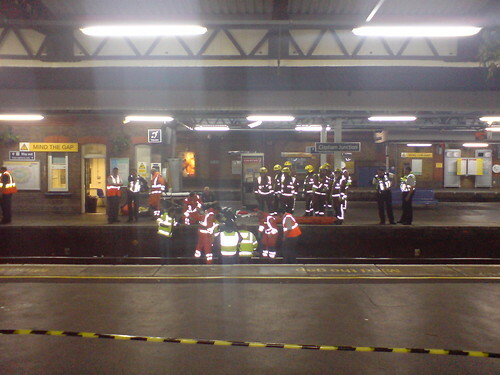 I was speaking to another passenger who said that he’d been told that the guy had been drunk, stumbling around on the platform, and then fallen on to the live rail. So be careful after you’ve had a few. I honestly hope he pulls through. Fresh in my mind was the recent story of photographer Alan Lodge who came a cropper with the law while photographing an armed robbery. The irony of the case was that Lodge helped draft the guidelines used by the Police for dealing with the press. There’s more on Alan’s blog here The whole public/private debate is at a critical stage right now. See my notes on a talk given by media lawyer Rupert Grey at the BAPLA picture buyers fair for more on the subject. It seems we live in an age when Pete Doherty can get away with possessing class A drugs for the umpteenth time but people can’t take photographs. Surfing, on a whim and a wave. Friday night 8pm in the Kings Arms, Roupell Street SW1. Toya and Dan yesterday took delivery of a circa 1980 Renault Trafic ‘Miami’ Autosleeper campervan they’ve christened Gary Claude Van Gary, and are planning to go surfing tomorrow. “You guys should come!” mrs e looks at me, I cancel a few other social arrangements, and suddenly I’m planning a trip to North Devon to go surfing….Dude. Being a child of the various great metropolises of this fair Nation, most of which are land locked by about 70 miles, I never got to do surfing as a younger lad, water sports consisted of school trips to Lake Windermere for a spot of kayaking. If you were from the city you did skateboarding, if you were from the countryside, especially the South West then you did Surfing, and if you still called your parents Mummy and Daddy into your teens you were probably posh and went skiing or snowboarding. The forecast was ‘messy’ so after a 30 second lesson from James, another friend who came along, we were in. The first 20 mins you’re just practicing staying balanced while lying on the board. After a while I managed to ride a couple in successfully, I only managed to pop up onto my knees once though. I had a great time, and would certainly do it again, perhaps with an instructor, but as a taste for the waves, this got me hooked. When you first ride on one, moving only by the power of the sea you get that ‘I’m doing it!’ feeling that you got when your Dad taught you to ride a bike. We were staying the night at Lobb Fields Campsite – I wouldn’t recommend it, but then I wouldn’t recommend camping full stop. The reception at Lobb Fields has every square inch covered in prohibitive signs. ‘Disposable BBQ’s are not allowed unless on a stand’ ‘Dogs must be kept on leads’ ‘all visitors MUST report to reception’ ‘No children’s ballgames near the toilet block’ ‘All pitches to be vacated at 10:30am’ it’s all about as welcoming as the face of the woman behind the desk, who must have been the inspiration for Roz in Monsters Inc. We weren’t allowed to pitch our tents near the van as ‘it’s against the law!’ So me and mrs e plus James paid a total of £36 for the privilege of pitching two tents on a 9’ by 9’ patch of mud, pitch 67 a.k.a the Quagmire suite, she actually sold it on the fact it was handy for the communal toilets and showers – oh joy!. A quick shower, a change of clothes and a stiffener in Gary van Claude Gary – which was cosy and snug, and we headed into Braunton for pie and mash at the George and a night cap and a game of arrows at the White Lion,before returning to the ‘Gate Locked at 10pm sharp!’ and ‘no noise after 11pm’ campsite. God I hate camping, I hate everything about it. ‘It’s only for one night’ I kept telling myself. The weather didn’t help, it was a windy nights, and when it wasn’t windy, it was raining. It was like sleeping in a tumble dryer, only not warm and fluffy. In the end I got out and slept for a few hours in the car. I awoke to see the place in the slate grey light of dawn. Hell, I’m in hell. I wouldn’t mind sleeping in a tent if when I unzipped the door I was looking at the foothills of the Himalayas, the alien vista of Tierra del Fuego, or the majestic Rocky Mountains. What I don’t want to see it a patch of muddy ground leading to the loos on my left and a big white grockle box on my right. Slowly the campsite wakes up, what I thought for a second was a cockerel crowing turned out to be a child crying. Women in the dressing gowns trudged through the mud to the communal showers clutching a basin full of last nights washing up to do. Misery, misery was etched on to everyone’s face, this is a British refugee camp I thought. To think some people work 50 weeks a year, 350 days to come to this… I’d have a 16 gauge buried under my nose if I had to do two weeks here. Can you tell I really don’t like camping? So, a bit stiff from a bad nights sleep I pull on a damp cold wetsuit and we head back out to the beach, it’s really windy on the Sunday and we both get battered even more, it’s still great fun and I manage to ride one or two in, as well as improve my paddling. After about an hour we call it a day, and get a hot tasty pasty and a coffee from the two bright young things manning the café hut. All the locals we meet looks fresh faced, fit and healthy, no one has that pallid stale look of a Londoner, must be the sea air? I was surprised to see that all sorts of people were surfing, mum’s and dad’s, old guys, girls (wet suits make women look hot! ), there was no of the ‘you’re not cool enough’ vibe or mocking of newbies, everyone was really chilled and nice. So, in short, I’ll be back… in a B&B or cottage…. real soon. Barbet’s off too! after a trial on BBC Breakfast saw him loose his national coverage cherry. You can’t keep a young gun like that down… What prompted it? What was the BBC pay review amount this year? 1. I’ve reached 200 posts and now have to pay £10 to continue – err, no thanks – you know your content, I helped created that. James gives the reason of costs, and how he barely breaks even – yes I’m sure it’s tough – But we’re talking text here. TEXT! It’s 2007! Jeez, his bandwidth can’t be that much can it? ALso by making people pay you’re naturally going to kill off a percentage of ‘elders’ in the group, people who have contributed the most. Mobile phone companies call this ‘churn’. 2. Over moderation/admin is another charge levelled at James. Natural flow of conversations is cut off with ‘no off topic’ remarks. James and the Mods fuss and fawn over every topic/issue post. Hypocrisy seems rife with some topics being allowed to drift and not others. You know what you’d never see on VN nowadays? Someone announcing something about their life… ‘I just passed my driving test’ or ‘I’ve had a baby boy’. All posts have to be about ‘community’ issues specifically to do with the Upper Norwood environment. People feel scared to post life trivia and it’s this that’s the oil in the community machine. 3. During Sainsbury’s take over in 2006 VN was the place to get all the latest gossip, the conversation flowed at breakneck speed and I for one logged in a couple of times a day. Now its people posting about the colour of paint of the shop next to Paddy Power – yawn – or its people moaning or complaining about things, it’s become very negative, curtain twitching and off putting. I used to really like VN, and the people on it, but the people I liked don’t post anymore. Consequently I feel it’s just become stale. It feels like a family party that’s gone on too long, like the plot of EastEnders it’s lost its way… So I’ll not be paying a tenner; I’ll also not be creating a new account under a different user name and email, as that’s just rude. So some of us have moved on to an un-moderated Facebook groups, here, here and here to get our shits and giggles. James and VNers, if you’re reading this, I hope you can see that the above are intended as constructive comments about VN and not a personal attack on any one person. Life’s not long enough to stuff a marrow. 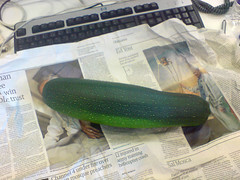 expressed an interest in courgettes. Does this extend as far as a small marrow?